Apparel made with Comfortemp® is soft on the skin, functional in outdoor sports fashion, protective and comfortable in work wear. Comfortemp® is the brand name for intelligent fabric into which mPCM materials have been integrated. They react interactively to changing body or outside temperatures. Depending on the individual situation or activity level they absorb excess body heat and store it until it is needed again. This keeps you in the comfort zone longer. The best known PCM is water. When thetemperature rises above a preset level, the PCM turns from a solid to a liquid state. When the temperature drops below a preset level, the PCM reverts from a liquid back to a solid state. This process will repeat as long as the temperature crosses the preset level. When the temperature rises above a preset temperature, the PCM automatically absorbs and stores the excess heat from the body, causing a cooling effect. This process turns the PCM from a solid state to a liquid one. 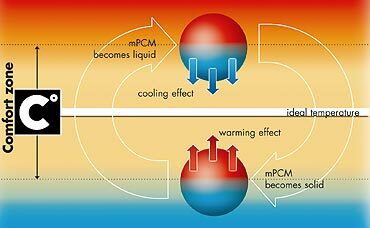 When the outside temperature drops below a preset temperature, the PCM automatically releases the stored heat back to the body, causing a warming effect. This process turns the liquid PCM back to a solid state. When the wearer of a garment containing Comfortemp® is outside in the cold, the mPCM are releasing the previously stored heat. When he or she returns inside where it is warm, the mPCM absorb heat and 'recharge' so that when the wearer steps into the cold again, the mPCM release the stored heat.